Mornings and I have been butting heads since 1983–the year I was born. That’s why brunch is quite possibly the best concept ever. I love everything about it. The idea that sleeping in is perfectly acceptable, the ease of drinking coffee near afternoon, the pleasure of indulging in breakfast and lunch foods simultaneously…it all feels a bit devious, but oh-so-good. When I roll to the big city of Atlanta, discovering new brunch spots is my tolerate-six-lane-traffic and fast-paced-people salvation. Upon my last visit, fate introduced me to Watershed on Peachtree. 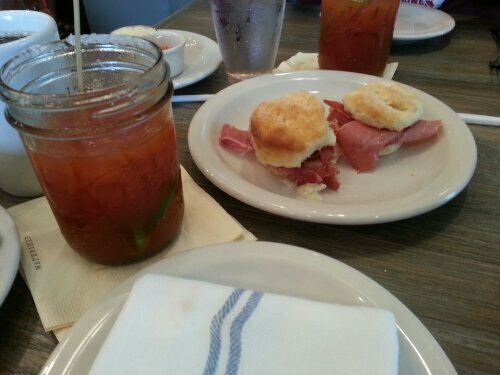 As if the complimentary valet parking wasn’t enough, the country ham biscuits served with peach marmalade, local honey and whipped butter almost sent me over the edge. It’s a Southern jewel with big presence, in a location where the competition is ravenous. Recently named one of the Best New Restaurants in the American South by Conde Nast Traveler, the highfalutin’ eatery is an upscale farm-to-table experience I believe everyone in the free world should try at least once. 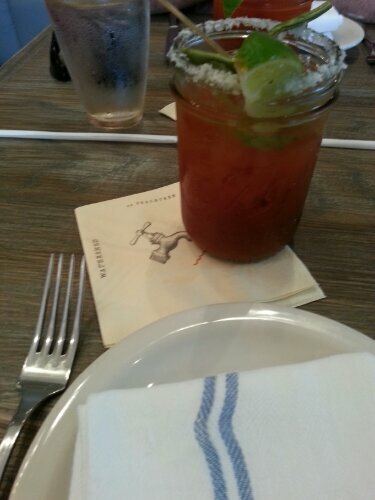 I ordered the Bay Bloody Mary above, when I learned it was seasoned with Old Bay. Garnished with pickled green beans, pimento-stuffed olives and a juicy lime wedge, the souped-up cocktail and salted rim had me at hello. Country ham is a rarity in restaurants anymore. To see it featured on the menu in its rightful place between two flaky, fall-apart-in-your-mouth buttermilk biscuits…what is life? Other Starters on the brunch menu include Pimento Cheese Toast, Wild Mushroom Toast, Sausage Gravy & Biscuit served with bacon jam and fine herbs, and Smoked Ham Wrapped Gulf Shrimp a la plancha (grilled). Coconut pancakes served with melted marshmallow creme and toasted coconut shavings, alongside coconut syrup. I’m attracted to all things coastal, even more so when I feel landlocked. Naturally, I ordered the Coconut Pancakes served with coconut syrup and a side of bacon. The bacon was cooked to perfection without an ounce of fat…lean and crispy, the perfect crunch to the meal. At just $10, the pancake stack was sweet and satisfying, keeping me full late into the day. Huevos Rancheros and Chilaquiles featuring eggs any style, heywood’s andouille, salsa ranchero. French fries because life is short. We also tried the Huevos Rancheros and Chilaquiles featuring eggs any style, Heywood’s andouille sausage and salsa ranchero. My boyfriend ordered a side of fries because the table’s order next to us looked so appetizing. Potatoes rock. Offering a variety of sophisticated, yet recognizable dishes like Chicken Fried Poached Eggs, Seafood Melange and a Crabby Shrimp Burger, the brunch menu also boasts classics like the Southern Cobb and Wild Georgia Shrimp Salads. Prices range from $6.50 for Starters to $18.50 for Steak & Eggs. The menu is conveniently displayed at the doorway. Elegant, understated decor makes for a beautiful setting. Seating includes tables and booths, in addition to private dining. Enjoy small plates or full entrees at the bar. Bright and open, the vaulted ceilings make the room feel large. Wesley Powell is quoted at the main entrance. Watershed on Peachtree on a Sunday morning. Serving brunch, lunch and dinner, the restaurant’s hours are written on a stand alone chalkboard. 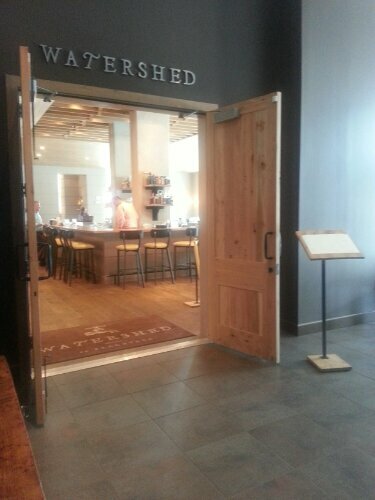 Watershed on Peachtree has a beautiful, raw setting that’s bright and open with modern lighting. From the moment you set foot in the elegant entryway, the cheerful and clean atmosphere invites you to stay. 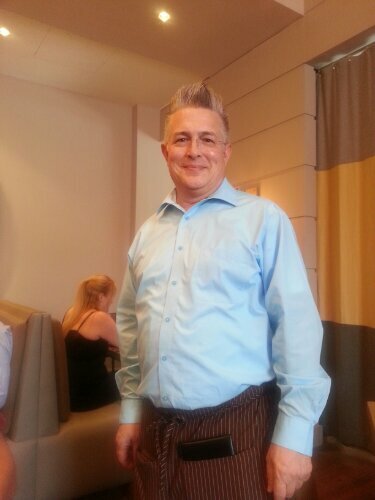 Our server, John had been waiting tables at the restaurant for just four months, but was very informative and most helpful. He told us all about the famous fried chicken served only on Wednesdays. In Southern Living magazine this month, Watershed on Peachtree is considered an upscale place to get The South’s Best Fried Chicken, noting it’s “always sold out by 8 p.m.” He also shared that Executive Chef Joe Truex, native Louisianian, couldn’t wait to begin serving up gumbo on Thursday nights. 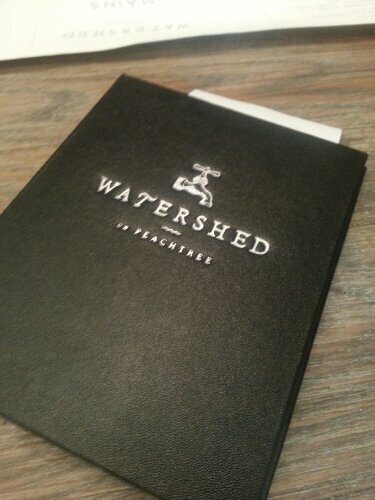 Watershed on Peachtree has a commitment to seasonal, locally sourced ingredients. Many of the cocktails are even organic! With an ever-changing menu, the restaurant’s cocktail napkins read, “creative and delicious Southern food enjoyed in comfort and community.” I couldn’t have said it better myself. This website was… how do I say it? Relevant!! Finally I’ve found something that helped me.Cheers!